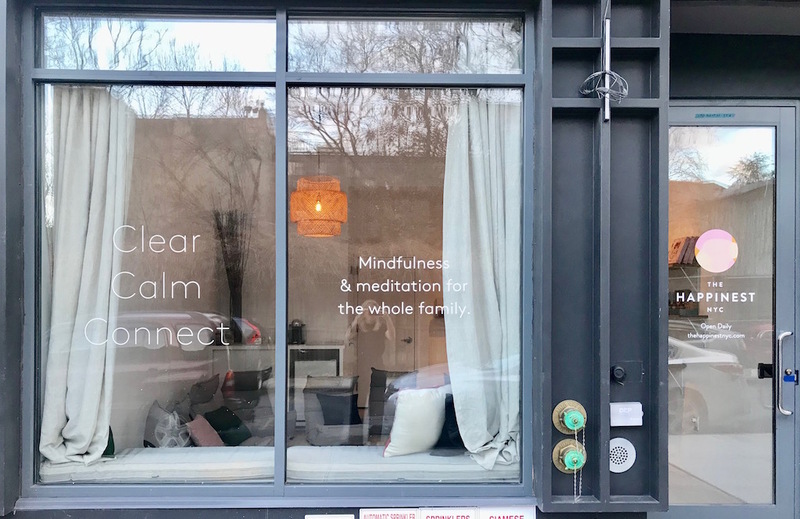 Williamsburg has more millennials than any other neighborhood in a major US city, and a new meditation and wellness center is joining a growing number of services catering to the burgeoning #strollermafia there. The Happinest, opening this month, will cater to kids of different ages as well as adults. The center’s meditation and mindfulness techniques are drawn from a mix of sources, including the Tibetan tradition. Sessions start around $18, and there’ll be a weekly free session for people who can’t afford the fee. Founder Charlotte Gibson discovered the benefits of meditation in her personal life, and then began using it with her students as an elementary school teacher in Australia. The changes in students’ attitudes and behaviors were dramatic, Gibson said, and soon, she was leading school-wide meditation sessions. She quit her job, started a business teaching mindfulness in schools, and eventually moved to New York. The Happinest will teach mindfulness principles to kids as young as 2. A three-hour session for toddlers will move through a range of activities, like matching faces with emotions, lightly active games with balls, and guided rest. 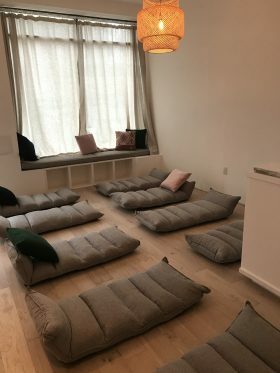 “Meditation and mindfulness are so versatile and the benefits are so rich for any type of person,” Gibson said, but New Yorkers are especially in need of the head space–especially little ones born into the hectic city. “There’s such a higher need in New York, and these children are being brought up in an environment we already find challenging,” Gibson said. It’s often easier for people to imagine the benefit of meditation in stressful adult lives than it is to recognize the emotionally charged experiences of early childhood. 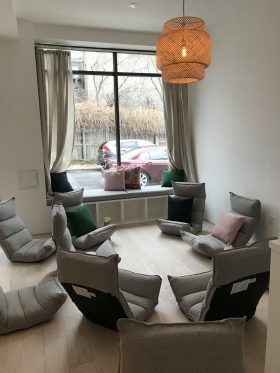 Community events, like movie nights and nutrition workshops, are also planned for the cozy studio at 170 S. 1st Street. The Happinest starts holding sessions this week. Their retail section is up and running, selling books and wellness products like crystals, supplements and CBD oil. Update, Dec. 4: This post was revised to reflect a new start date of sessions.